Anne McCarty Braden (1924--2006) rejected her segregationist, privileged past to become one of the civil rights movement's staunchest white allies. In 1954 she was charged with sedition by McCarthy-style politicians who played on fears of communism to preserve southern segregation. Though Braden remained controversial -- even within the civil rights movement -- in 1963 she became one of only five white southerners whose contributions to the movement were commended by Rev. Martin Luther King Jr. in his famed "Letter from Birmingham Jail." Braden's activism ultimately spanned nearly six decades, making her one of the most enduring white voices against racism in modern U.S. history. 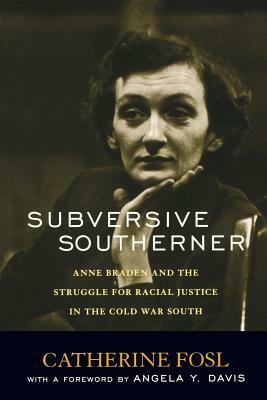 Subversive Southerner is more than a riveting biography of an extraordinary southern white woman; it is also a social history of how racism, sexism, and anticommunism intertwined in the twentieth-century South as ripples from the Cold War divided the emerging civil rights movement. Catherine Fosl is an assistant professor of Women's and Gender Studies and director of the Anne Braden Institute for Social Justice Research at the University of Louisville. She is the author of Women for All Seasons: The Story of the Women's International League for Peace and Freedom.